Ayutthaya Railway Station is located on the East side of the river 3.1 km walking distance from Bang Lan Night Market in the centre of Ayutthaya. Built in 1921 the main station building and the ticket hall has been superbly preserved and this is one of Thailand’s best train stations. The station is a busy transport hub with all trains travelling on the Northern Line and the North Eastern Line stopping here. Ayutthaya Train Station was built in 1921 and the original structure is still in use, making this one of Thailand’s oldest and most attractive railway stations. The platform area is fairly standard, but the ticket hall and administrative office next door have been superbly maintained and retain the neo-classical design features common in Thai architecture at the time which was heavily influenced by Italian designers and architects. Ayutthaya Railway Station is located 44 miles (71 km) from Bangkok. All trains travelling on the Northern and North Eastern lines come through here – over 70 day and they all stop here. Its a relatively short distance to Bangkok and many people use the station for day trips to the historical park, which is why the station was built in the first place. At one point in time Ayutthaya is thought to have been the largest city in the world and the historical park contains a number of very impressive, if poorly preserved, temples built and used by this prosperous ancient community. An invading Burmese army destroyed much of the temple complexes when they ransacked the city in 1767. Train #7 departing at 09:48 is a popular service because it both the faster service from Ayutthaya to Chaing Mai and the only train to complete the majority of the journey in the daylight. Train #9 is a popular choice for the overnight journey from Ayutthaya because this train uses the brand new carriages introduced in November 2016. 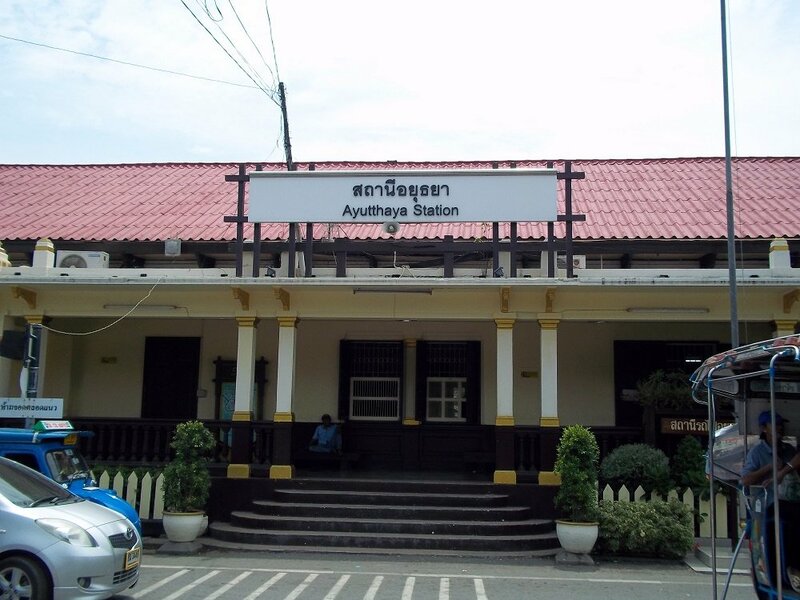 Ayutthaya railway station is not located in the historic town centre. It is 4.4 km walking distance from the historical park to the East and on the other side of Pa Sak river. Outside the train station there are normally many tuks tuks waiting for passengers. Expect to pay around 100 THB to go to the historical park, or other point within the old city. The journey time is around 10 minutes. Advance tickets are available for purchase in the ticket hall on the right side of the station as you enter. If you want to purchase a ticket as a foreigner you need to to show your passport. You can turn up and buy a ticket on the day for 3rd class seats or the slower standard trains, however, if you want a sleeper (advisable for the long journey up to Chiang Mai or Nongkhai) or a 2nd class seat for one of the faster sprinter or express, you should book in advance. If your onward journey is to trip to Pak Chong or Nakhon Ratchasima advance ticket purchase is not always possible on the normal trains, however, because the journey is only short 3rd class seats are sufficiently comfortable. Use the Search Box below to buy your train tickets online. Simply enter your destination and date of travel and click to find tickets. Tickets on shorter journeys, such as the journey to Bangkok, are not available to book online but the very popular service from Ayutthaya to Chiang Mai can be booked online. Book now to secure a sleeper seat on this long journey. Food: A coffee and drinks stand at the right hand side far end of Platform 1. If you go out of the station on the other side of the road is small road with lots of food stalls and cheap small restaurants. If you turn left from the station and cross the road there is a 7-Eleven convenience store about 80 metres down the road. The food stalls outside the 7-Eleven serve a fairly good plate of chicken and rice or bowl of noodle soup. Cargo Services: As you enter the station the Freight & Parcels Office is about half way up the left hand side of Platform 1. There is no requirement to travel with cargo on the same train or any train in Thailand and you simply pick it up from the train station of your choice the same day or the next day depending on when the train arrives. Transporting Bicycles from Ayutthaya train station: You can transport bicycles on trains from Ayutthaya train station if the train has a cargo car. Some trains do, others do not. Unlike other forms of cargo, in Thailand you need to load and unload bicycles yourself which means you need to travel on the same train. To purchase a ticket for a bicycle go to the Freight & Parcel Office at Ayutthaya train station after you have purchased your own train ticket. Keep the ticket for the bicycle safe as you will need to show the ticket at your destination in order to collect your bicycle. For more information see our Guide to Carrying Bicycles on Thailand Trains. Located on the same road as the train station. 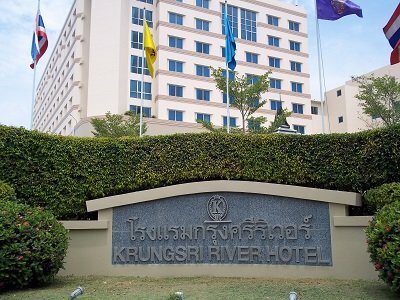 This is probably the best large hotel in Ayutthaya. The hotel has been built on a grand scale and it is popular with corporate customers. It has a swimming pool, fitness centre, bar, coffee shop and large restaurant. The rooms are big at 30 sqm and well appointed with the facilities you would expect from a 4 star hotel. The view over the river is good and the bar can become lively in the evening (the guests are often here at the expense of their companies) although the sound insulation is good at this hotel so you can sleep well.